He is the Founding Director of the Center for Energy Research/Education/Service (CERES) providing interdisciplinary academic support focused on issues related to energy and resource use, alternatives and conservation. He serves as Founding Chair of the university-level Council on the Environment (COTE) a clearinghouse for campus-wide sustainability. He also serves as Founding Co-Chair of the Greening of the Campus Conference Series, the 9th of which was held in March of 2012 and featured the dedication of the university’s campus-wide geothermal district heating and cooling system. He is the university liaison to the American College and University Presidents Climate Commitment (ACUPCC) and the Sustainability Tracking Assessment and Rating System (STARS). For the last four years he has been involved in the piloting of a new methodology by which universities can qualify their carbon reductions for transaction in the voluntary carbon market. This work was funded by the Chevrolet Climate Reduction Initiative. 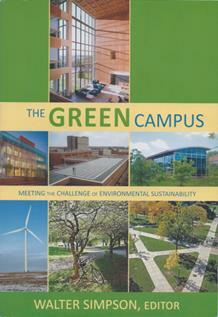 This includes building design and campus-wide energy conservation and alternative energy technology implementation. In addition he is a Founding Member of the Board of Directors of the Association for the Advancement of Sustainability in Higher Education (AASHE) and the Formal Education Committee of the U.S. Green Building Council (USGBC). He has presented at international conferences in Austria, Canada, England, France, Germany, Ireland, and Japan, and at domestic conferences including the national meetings of AASHE, AIA, APPA, ACSA, ASES, SBIC, SCUP and USGBC. For some five years he collaborated in offering FEMP workshops on “Design Strategies for Low-Energy, Sustainable, and Secure Buildings” throughout the country based on a curriculum model which he structured and more recently, and has provided consultation to the sustainability planning of the Children’s Museum of Indianapolis and the National Wildlife Federation Campus Ecology program.